When we arrived in Phnom Penh, tired, hungry and temporarily sick of the haggling process, we opted to walk to our hostel using the directions we had. The only problem was the numbering system in Phnom Penh is unlike what we’d ever seen before; the street numbers seemed to be randomly allocated. After combing the street, we found our hostel – and after climbing three very narrow flights of stairs we collapsed on our bunks in our ridiculously air-conditioned room. When we returned from dinner, we were greeted fondly by our three rugby crazy Welsh room-mates (Laura, Alex and Bethan – who were mind-blown by the thought of James bossing around famous players on a regular basis!). Our local food joint in Phnom Penh quickly became the Laughing Fatman. The pancakes were top notch, especially when we ordered them hungover, with sides of ice-cream and hasbrowns. If on a time limit when travelling, Cambodia’s capital is a good place to skimp on. 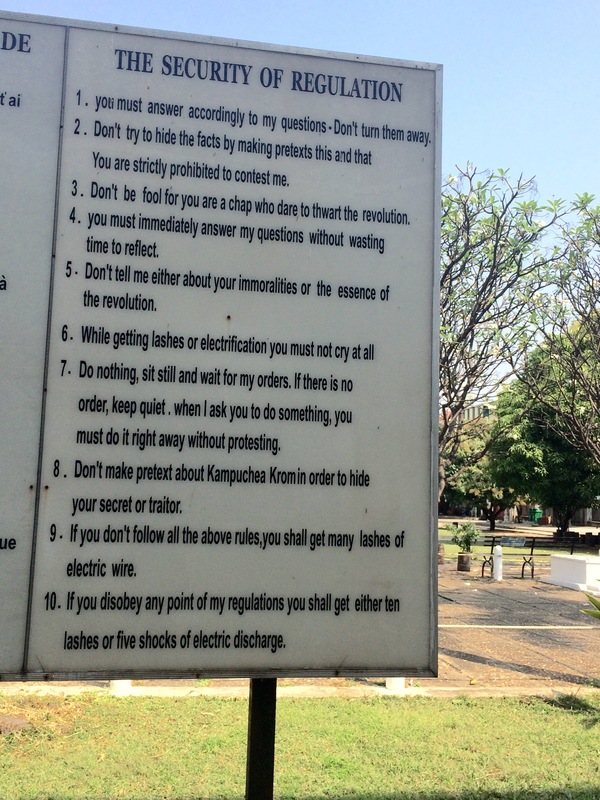 At least one full day is required however; we partook in a self-conducted walking tour – heading along the water front, past the palace, and eventually ending up at the Toul Sleng museum – which was undoubtedly a severely sobering experience. 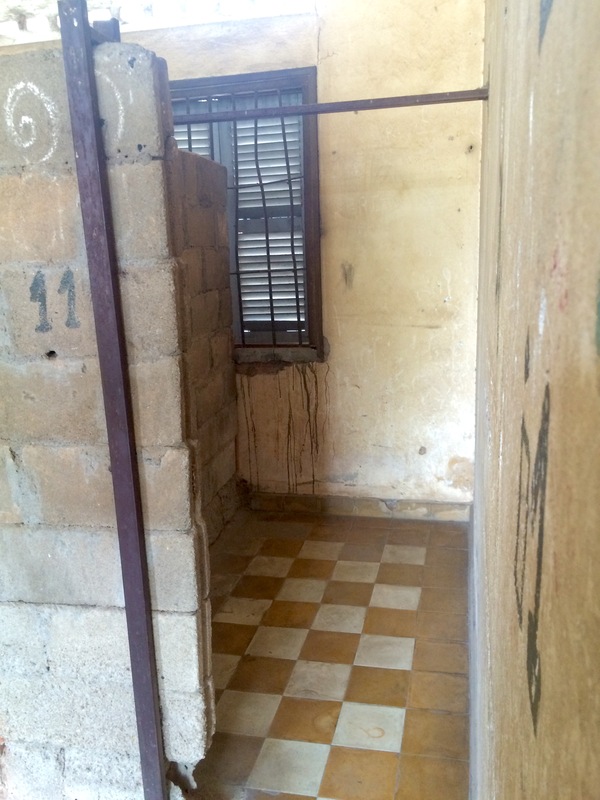 A former high school, it was turned into a prison (and execution centre) by Pol Pot during the Khmer Rouge. They say pictures speak a thousand words, and while the museum was not as informative as my geeky self would have idealised, I guess there is an element of truth to that old phrase. One of the more heart-wrenching sights was the photos of Khmer Rouge victims lining the walls – dead, nameless, innocent; but never forgotten. We left a few hours later, and in our shell-shocked state, we completely bypassed one of the seven survivors from the camp signing books and chatting with people inside the grounds. We struggled to find anywhere decent nearby for lunch, so eventually made our way to the Russian Market – where James and I splashed out on some beef noodles for 50c each (so fresh and delicious!) and then before meeting up with Summer in KFC, we really emptied our pockets by buying a whole watermelon ($2), which we promptly proceeded to demolish on yet another heated Cambodian day. We waved down a tuk-tuk who was willing to take us out to the Choeung Ek Killing Fields which actually ended up being quite a way out of town. We were given audio guides, which only heightened our experience, and accentuated our emotions. Very slowly we made our way around– the rather eerie feeling the area possessed was somewhat diluted by the number of tourists. As survival stories filled our ears, signs warned us not to tread on the bones and teeth that were quite visible as they jutted above the ground. 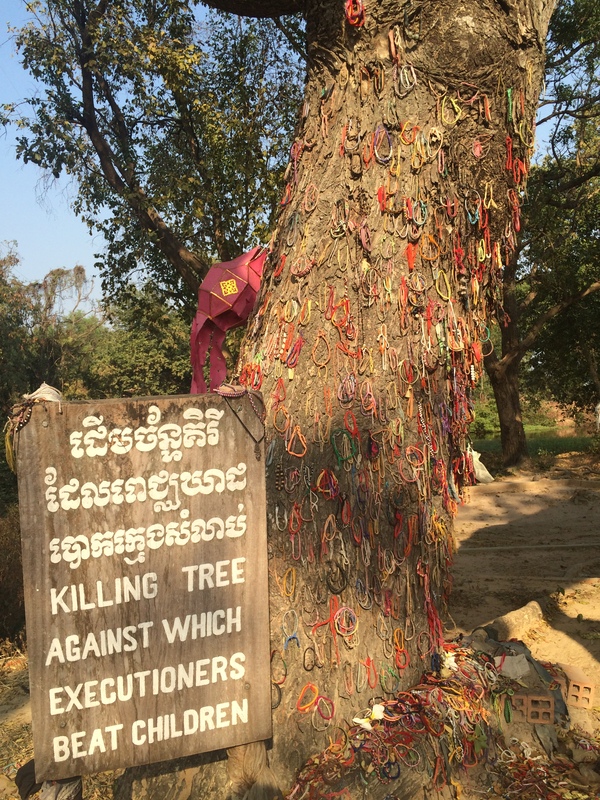 Both Summer and I left friendship bracelets on one of the mass graves, as well as a tree significant for being where the babies were bashed to death before being thrown over into the pit of dead bodies. 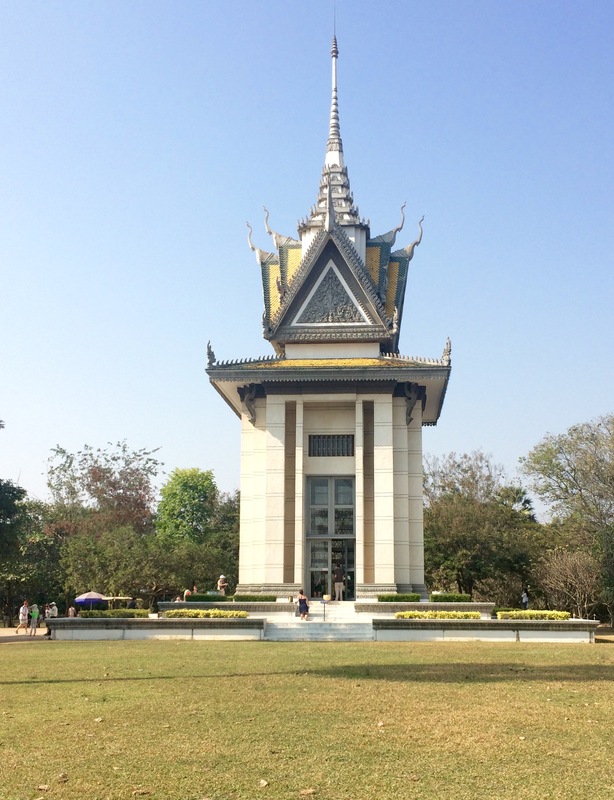 At the end (slash entrance) is a shrine that is constructed out of bones from the victims. Needless to say, it was a sombre, reflective ride home. We reunited with the Welshies who had had a similar day to us, but performed in reverse. I think we did the right thing to start at the Museum, because not only did we follow the same path that the victims would have taken, but also the Museum was slightly more tiring (as less engaging) and it was nice spending the afternoon outside. Together, we vowed to cheer each other up and headed out to a street vendor near the local market. Summer, Laura and Alex had chicken fried rice, Jim and Bethan had chicken noodles, and I was the only one to order beef. I certainly ordered right – there were so many bones accompanying the chicken, it was nearly impossible to eat. After wiping down our free beers (for rat urine apparently?!) we had a few drinks, before then heading out for a few more. We stopped at a 2-for-1 cocktail bar where we had some serious confusion. I accidentally ordered four (because no-one told us that you only got a free one of the same kind) but thankfully James took two off my hands. When our cocktails came out looking completely different to what we thought we’d ordered, we were told that ‘what you order on the menu, isn’t always what you are given – and what you are given, isn’t always on the menu’. Interesting! The cocktails were still delicious, but after that we decided to try somewhere else. I had another bout of miscommunication – apparently the waiter was under the impression I had ordered a beer tower (which would have been no small feat!) however I made myself clear, and got it swapped for cocktails. 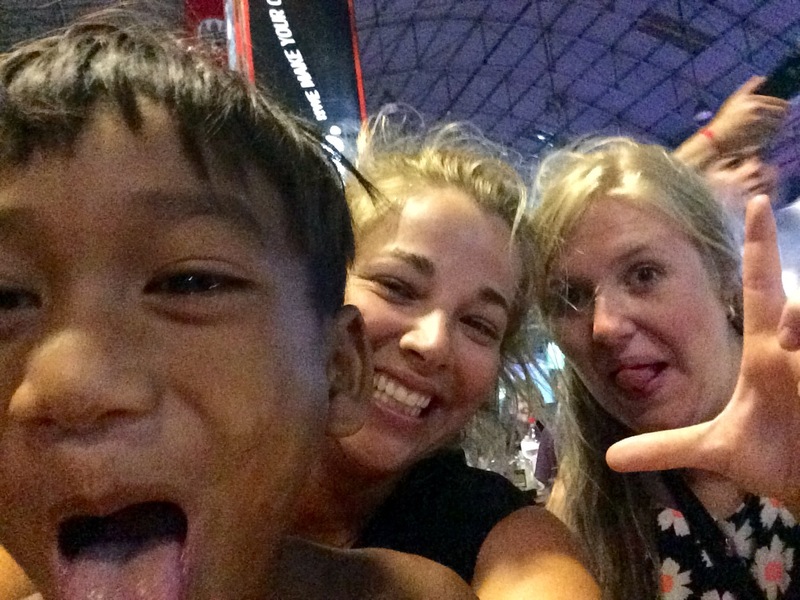 We befriended a little boy who joined us for the rest of the night – entertaining us with his endless questions, curiosity and outright cuteness. Although experiences such as the Killing Fields and Museum tend to leave you feeling rather stunned, and often depressed (I also felt this way after visiting the concentration camp outside of Berlin) I have a strong desire to learn, appreciate and respect horrible events of our past, such as this.For more information on the Khmer Rouge, click here. I also bought and read an incredibly enlightening book called “First They Killed My Father” which retells the story of Loung Ung, who as a child, endured and survived the Khmer Rouge. Previous Post Turn Down For WAT?